Chinese cassia cinnamon, star anise, anise seed, ginger and cloves are added to these dainty french cookies sandwiches with caramel and loaded with flavor. I was trying to come up with a way to make our gingerbread houses into a post. Though they are rather cute, I highly doubt that gluing kit-kats together with royal icing constitutes a recipe! So instead there will be a juxtaposition in this post. Successful macaron recipe and attempts at gingerbread houses. I'll give you a few guesses on the top left gingerbread house before I tell you what it is. No, it's not a shack from Deliverance. Guess again! 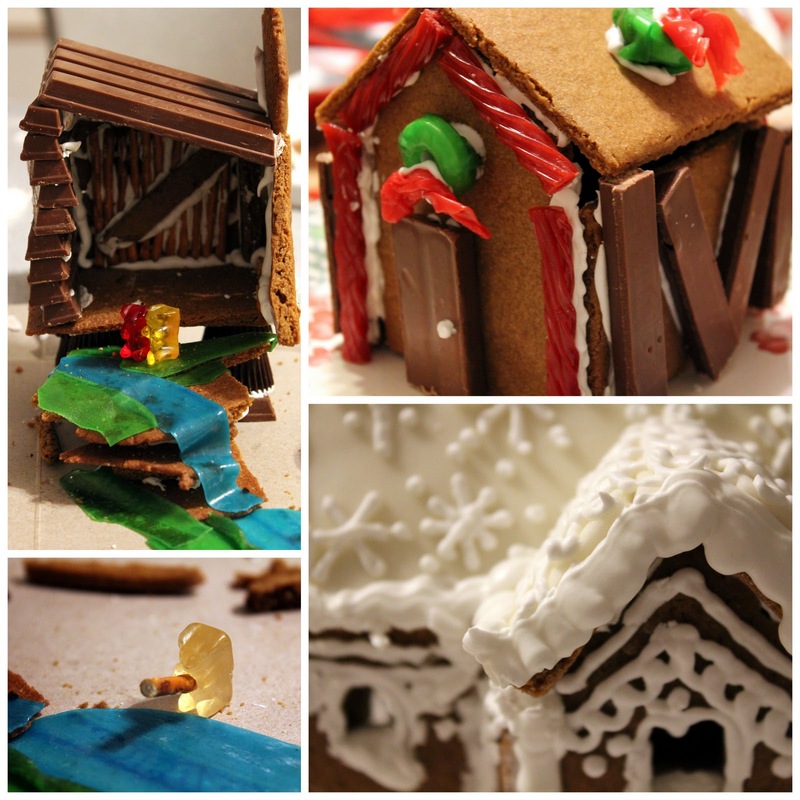 Nothing Tim Burton whatsoever, though yes, there is some resemblance to his Hansel and Gretel project. Good guess! Try once more. Oh, and here's a clue....that gummy bear at the bottom that looks like he met the business end of a gingerbread Narwhal, he's meant to look like he's fishing. Oh, sad! You wasted your last guess on Tom Sawyer. Nope. ....okay, so I have no idea what you guessed, most likely it was far more entertaining that my guesses. 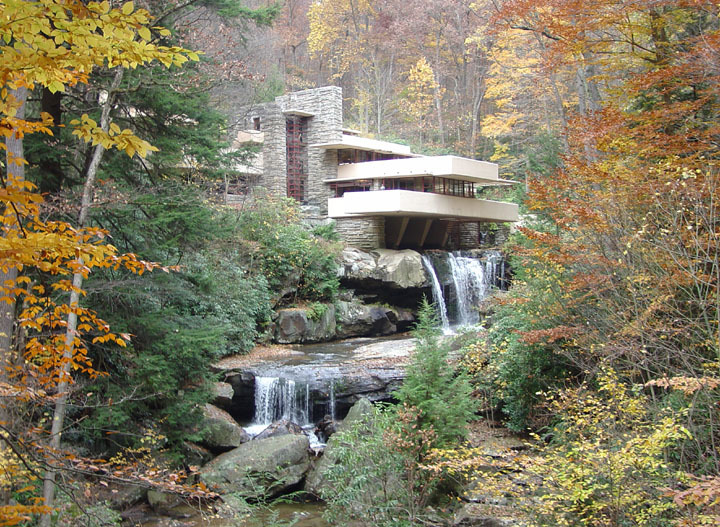 The real answer is Falling Water by Frank Lloyd Wright. Bonus points for creativity. This was Brandon's invention. The rest of us at our gingerbread house competition were a bit more traditional. I made a Victorian house. It had cellar doors, a bay window, a chimney, and about 32 pieces that I baked up. I got the pattern from an online site and should have been VERY wary that there was no completed picture! I can only assume that there is no actual way of completing this house! In the end I had an okay structure, without the cellar, bay windows or chimney. It did have a nice roof and snow (bottom right of the collage) but it was not a Victorian house by any stretch of the imagination. In all reality it was a basic stucco cookie cutter home I could see anywhere in the Southwestern section of the United States. SAD! After cutting and re-cutting all those little pieces, half of them just wouldn't work out......and to top it all off the darn thing collapsed. (I blame my fake snow. I think it was too heavy for the load bearing walls to manage). It was an excellent learning experience. 1. keep it simple people! 2. decorate the walls before assembling the house. 3. know what your completed house looks like. gingerbread puzzles are not fun. (I had to re-arrange the walls a few times before they were in their proper places). 4. re-cut all the walls after baking. they spread out and that's no good. 5. watch the weight of your roof! I used fondant to cover the roof. be wary! After all that I have to now find a way to transition to the juxtaposed macarons. Ha. I'm not that great a writer. Not. Gonna. Happen. These macarons were ones I made at my mother's house and took to the family Christmas dinner. I made them a bit "spicy" shall we say. Very flavorful. I used my Chinese Five Spice powder (Chinese cassia cinnamon, star anise, anise seed, ginger and cloves) which is not the traditional mix with Fennel in it (thank heaven!). Consider them my redemption for failing miserably with gingerbread this year. I found the spice to be strong and addictive, my mother would have halved it. Take your pick! One teaspoon or two you can't go wrong with five spice and caramel! Place yolks in a stand mixer. Bring 4 tablespoons butter and cream to simmer in heavy small saucepan. Gradually whisk hot cream mixture into yolks. Stir sugar and 5 tablespoons water in heavy medium saucepan over low heat until sugar is dissolved. Increase heat and boil without stirring until syrup is deep amber color, occasionally brushing down sides of pan with wet pastry brush and swirling pan so caramel will color evenly, about 10 minutes. Slowly whisk hot caramel into yolk mixture, then whisk until smooth. Transfer caramel mixture to small bowl; let stand until no longer warm to touch about 1 hour. Whisk in remaining butter. Cover and chill one day prior to use. In a stand mixer, fitted with the whisk attachment, whip the egg whites into a foam, gradually adding the sugar. Continue to beat into a meringue. Sift together powdered sugar, spices, and almond meal to remove any clumps. Gently sift into meringue gradually folding in, usually as few strokes as possible. Moving quickly fill a disposable pastry bag with the macaron batter with a 3/4 inch wide cut end. Pipe small rounds one inch in diameter and one inch apart, onto the baking sheets. Allow to rest for half an hour. Bake for 15-20 minutes. My experience is that if the macarons are hard to remove from the paper, they need more time to bake. Allow to cool on the pan and then remove. Store in an airtight container in the refrigerator until ready to fill. Scoop and roll two teaspoons of caramel, gently flattening into a disc roughly the size of the macarons, gently sandwich between two.